The aim of this study is to evaluate the surgical outcomes of single-port laparoscopic percutaneous extraperitoneal closure of inguinal hernia using “two-hooked” core needle apparatus in children. This study was conducted at Affiliated Hangzhou First People’s Hospital, Zhejiang University School of Medicine between January 2016 and June 2018. Five hundred and eighteen patients under the age of 12 years with inguinal hernias were subjected to single-port laparoscopic percutaneous extraperitoneal closure (SPLPEC) using non-absorbable suture by “two-hooked” core needle apparatus. Description of the technique is as follows: Under general anesthesia, a 0.5–0.8 cm trans-umbilical skin incision was done for insertion of a 0.5 cm port. A “two-hooked” core needle apparatus was used for insertion of a non-absorbable suture around internal ring. The suture knot was tied extracorporeally. 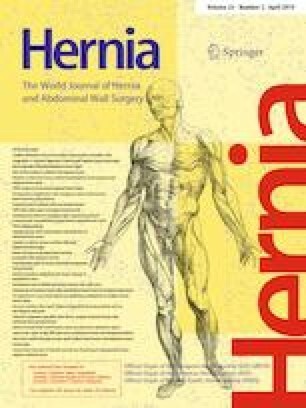 Among 518 child patients with inguinal hernias, there were 406 males and 112 females with a mean age of 4.6 ± 3.5 years. One hundred and six cases were subjected to bilateral surgery including 91 cases of contralateral patent processus vaginalis (PPV). Three cases converted to open surgery and additional 0.5 cm port was done in five cases. The mean operative time was 13.2 ± 3.5 min for unilateral hernia repair and 16.9 ± 4.6 min for bilateral cases. All patients achieved full recovery without complications such as surgical site infection (SSI), testicular atrophy, or iatrogenic ascent of the testis. At the mean follow-up time of 18.72 ± 5.27 months, two cases had recurrences (0.39%) and one case had postoperative hydrocele (0.19%). SPLPEC of inguinal hernia using “two-hooked” core needle apparatus in children is a feasible and reliable minimal invasive procedure. It has the advantages of short operating time, low complication rate, low recurrence rate and better cosmetic result. HY and QC contributed almost the same and mainly do the writing of this paper, language editing and reviewing of related literature together. So these two authors are co-first authors. YJ and GZ collected the data and did the statistical analysis. W Ping and GG are the superior directors who were referred to when managing clinical cases. HY, ZF and WH did most of the operations and did the follow-up. This study was funded by Beijing Municipal Administration of Hospitals’ Youth Programme Code: QML20170307. YH, CQ, PW, FZ, GW, ZG, GG, and JY declare that they have no conflict of interests. This study was approved by Institutional Review Board approval and the study including human participants had been performed in accordance with the ethical standards of the Declaration of Helsinki and its later amendments. This article does not contain any studies with animals by any of the authors. Informed consents were obtained from all patients’ parents or guardians.